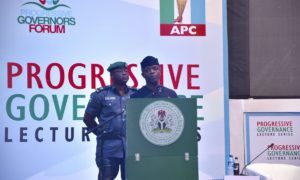 There was confusion at the national secretariat of the All Progressives Congress in Abuja on Wednesday as the party failed to hold its monthly meeting with the governors elected on the platform of the ruling party. Some party members said the meeting could not hold due to the short notice to the governors, even as two governors were present at the secretariat to attend the meeting. The two governors are those of Jigawa State, Alhaji Mohammed Abubakar, and the Deputy Governor of Edo State, Mr Philip Shuaibu. The two were at the party secretariat before they reportedly learnt that the meeting had been cancelled. It was gathered that the meeting was shelved after the National Working Committee got hint that some of the governors would not attend because of their grievances against party leaders. The recent ward congresses held in Kano and Kogi states, which ended in controversy, were said to have made the governors of the state angry because they were not happy with the positions taken by the Chief John Odigie-Oyegun-led leadership. Other governors, including the governor of Kaduna State, Mallam Nasir el-Rufai, were also said to be angry with the position of the party on the last congress. Oyegun had said that the party was looking into complaints arising from the congresses in some states, especially in Rivers and Kaduna states. Wednesday’s failed meeting was supposed to be the fifth in the series of the monthly meeting of the APC NWC and the governors. During the first meeting, which held in April, the party stated that the meeting was in preparation for the 2019 general elections. The party had also used the meeting to address the financing of the party and the proposed non-elective National Convention. The suspended meeting would have been the first to be attended by the APC principal officers of the National Assembly. But in his reaction, Abdullahi told our correspondent that the meeting could not hold because of another meeting of the governors with the Acting President Yemi Osinbajo.